Foundations are unique among organizations in the enormous latitude they have in determining their work and the manner in which it is done. This flexibility manifests itself particularly in the variety of roles that foundation board members can take. Most of the literature in the field focuses on best practices in board structure and processes. These are necessary in the spirit of responsiveness and legal accountability, but are not sufficient for effectiveness. Achieving role clarity, influence in decision-making and responsibility for impact are three keys to more effective foundation governance. These three attributes can be better understood and achieved by examining the roles of foundation board members as individuals and as a collective. Recognizing these important, often overlooked, phenomena will help boards not only have good work that will keep them enthused and committed, but also to produce the good work that the public expects. This publication is Hauser Center Working Paper No. 26. 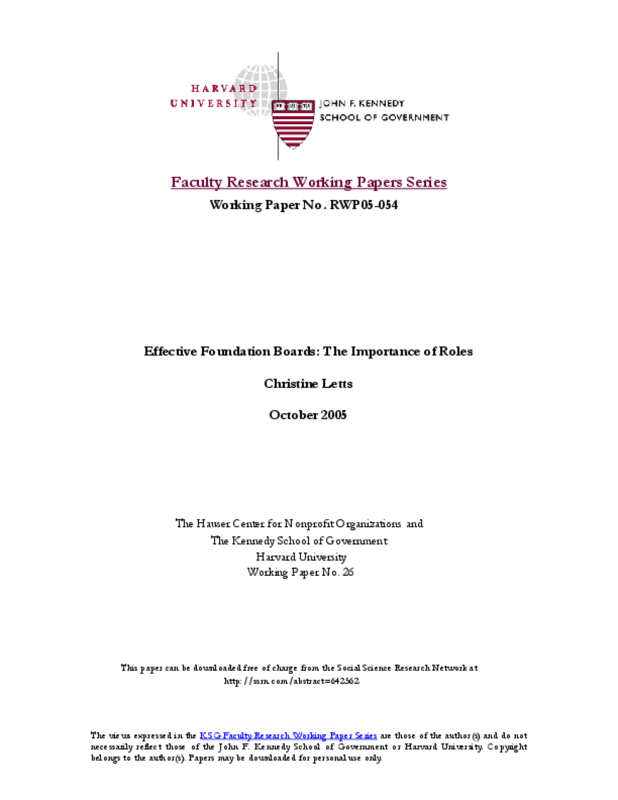 The Hauser Center Working Paper Series was launched during the summer of 2000. The Series enables the Hauser Center to share with a broad audience important works-in-progress written by Hauser Center scholars and researchers.